This is a tough month for favorites. Not only have I been trying a lot of new products, but I was also traveling for about a month this summer and when I got back, I just wanted to play with all the makeup I’d left behind! So there aren’t too many things I’ve been using consistently, but that does mean that the things I have been using have really had to stand out in the bunch! So here are my September Favorites! Studio Makeup On-The-Go Palette: This should come as no surprise, since I raved about it in a recent review. After 5 or 6 days of consistent use, I finally had to tear myself away from this palette to try a few others for upcoming posts. I had even received several new palettes in the mail while I was using it–I didn’t stop using it to try the other new things! If that’s not a favorite, I don’t know what is. 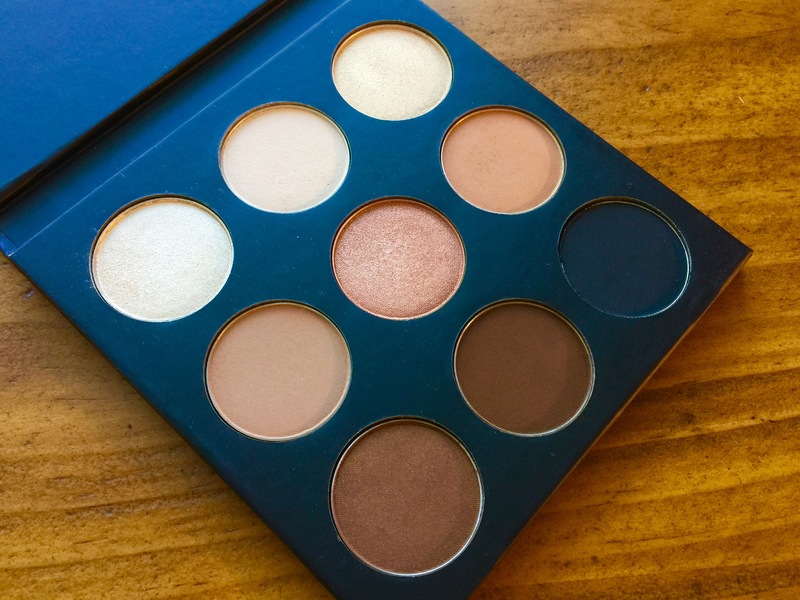 Check out that review if you want to learn more specifics, but briefly, this is a neutral palette with a perfect everyday or night out shade selection, and it came in this month’s Boxycharm. It is also available the Studio Makeup website. 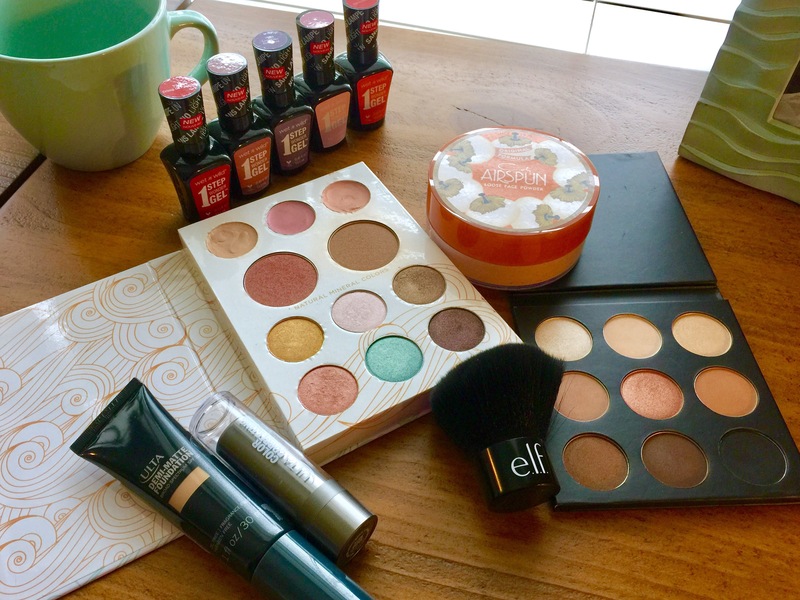 This was actually a big month for eyeshadow palettes for me: I got several from the Balm, Sleek Makeup, and the Miss Jen Fabulous palette from Ulta. (I’ve done a review on the Miss Fabulous palette, and while I used it a lot when I bought it, I also knew that I would use it even more come fall. The warm oranges and reds are perfect for October/November.) I also picked up a Too Faced Grand Hotel Cafe holiday palette that I’ll be reviewing soon, so be sure to stay tuned! Tony Moly Hyaluronic Acid Hydrating Sheet Mask: I did not want to take this off. It felt cool, soft, and so refreshing and soothing. My skin looked and felt radiant. After the nightly struggle to keep the preschooler in bed, nothing could be more relaxing. A hydrating sheet mask and Big Bang Theory reruns on TBS? YES. I’ve tried several other sheet masks this month and liked them, but this is certainly the stand-out. 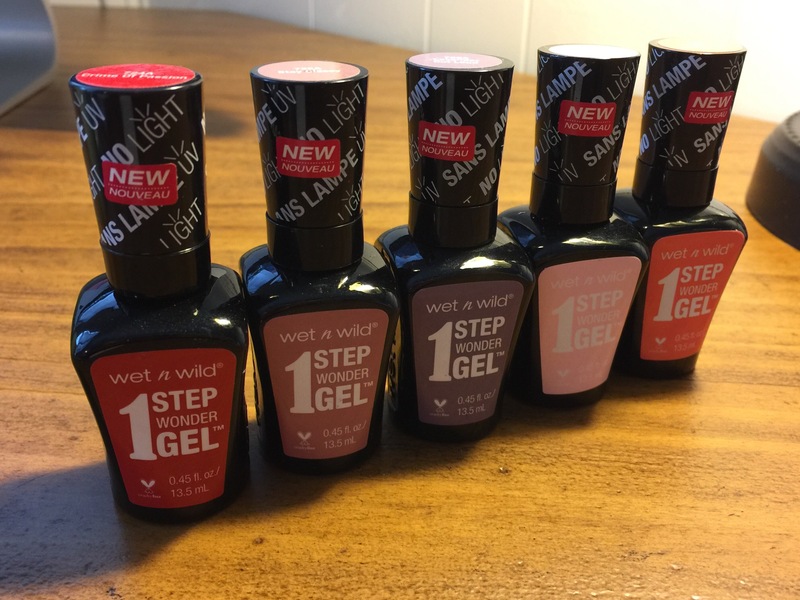 Wet n Wild One-Step WonderGel Nail Color: Why, oh why won’t fall just get here already? This line of nail polishes has such great fall shades–maroons and plums and burgundies, oh my!–and the application and wear time is fantastic. As someone who is particularly hard on my nails, this polish lasts for 3-4 days without chipping. On a regular human who doesn’t fidget and mess with her nails all day long, this would probably translate to at least a week. And I love the brush on these nail polishes–it is wide and slightly angled, making it easy to apply the polish in a few strokes and maneuver around the curve of the nail bed. 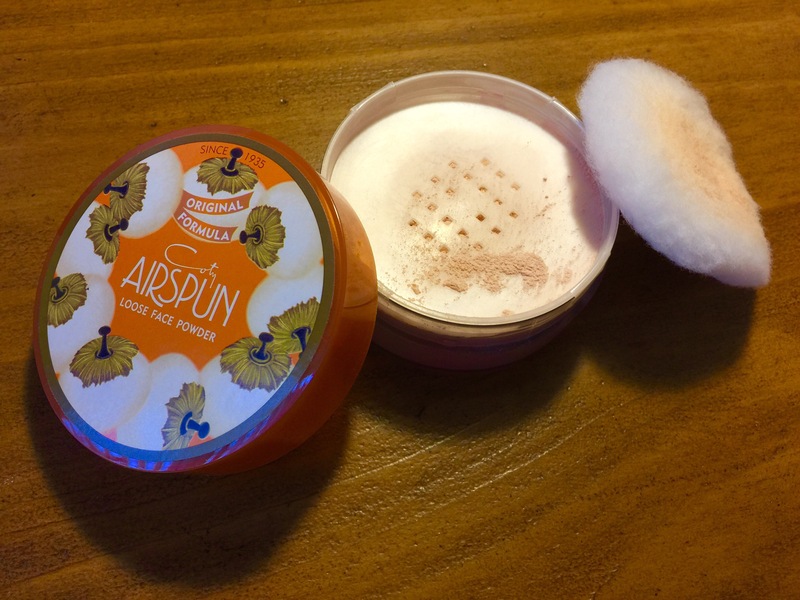 Coty Airspun Loose Setting Powder: During a recent lunch with a friend, we discussed the pros and cons of various makeup setting powders. (Our lunches typically last 2-3 hours. We really like makeup.) I’d tried a few that really didn’t work recently, and I mentioned that I’d wanted to try this one. Instead of my usual translucent powder, I decided to try an actual pigmented powder since I’ve been enjoying a few I’ve purchased and received as gifts with purchase lately. I chose Honey Beige, and let me tell you, it was love at first application. It is very finely milled (hence “airspun” in the name), blends easily into the skin, and does not move or crease throughout the day. Since I have dry skin I only use it in my t-zone and as an under-eye setting powder, and it works beautifully for both. You also get a ton of product–2.3 oz.! For comparisons, a container of my other favorite, the NYX HD Studio Setting Powder, contains 0.28 oz, and the Laura Mercier Translucent Loose Setting Powder contains only 1 oz. So this is more than double the size of your typical container of loose setting powder. And it’s $6. I mean, really. Now, as you may know, this is a highly scented powder. It smells like something your grandmother might wear. And that makes sense–it was formulated in the 1930s and seems not to have changed much. I do hear that there’s an unscented version, but to be perfectly honest, I have come to love the smell … and I really don’t like perfumed products. But somehow the retro vibes of the whole product–packaging and powder–really work for me! 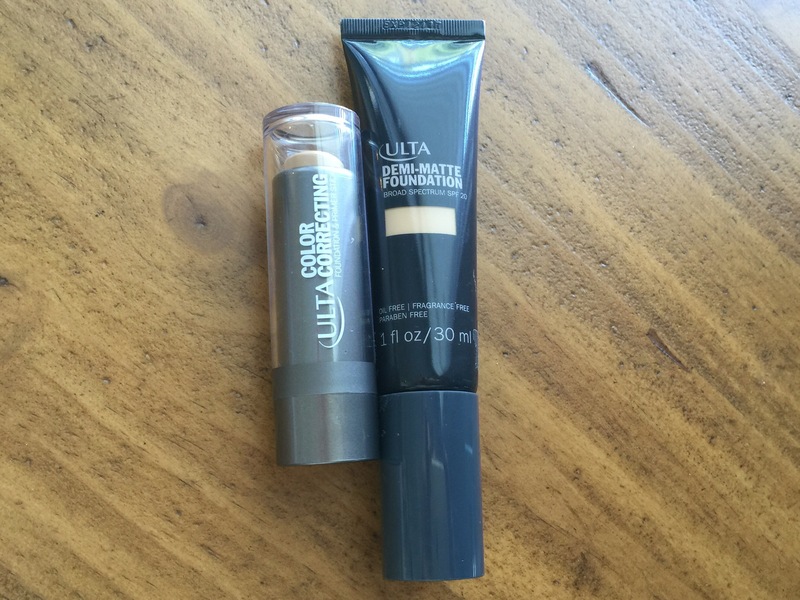 Ulta Demi-Matte Foundation and Ulta Color Correcting Foundation and Primer Stick: I think these are basically the only foundations I’ve used this month. I purchased them at the beginning of Ulta’s 21 Days of Beauty sale (now ended) for a blog series reviewing Ulta-brand products (I did Blushes and Highlighters, Foundations, and Lip Products). I adore both of these foundations. The stick foundation does tend to settle into fine lines, but with the Coty Setting Powder, that occurs far less. Both look gorgeous on the skin and I get compliments every time I wear them. Even though I enjoy trying out foundations, these are two I will absolutely repurchase when I either finish them up or when I need a lighter shade now that fall is approaching. If you want to read a full review, you can find it here. 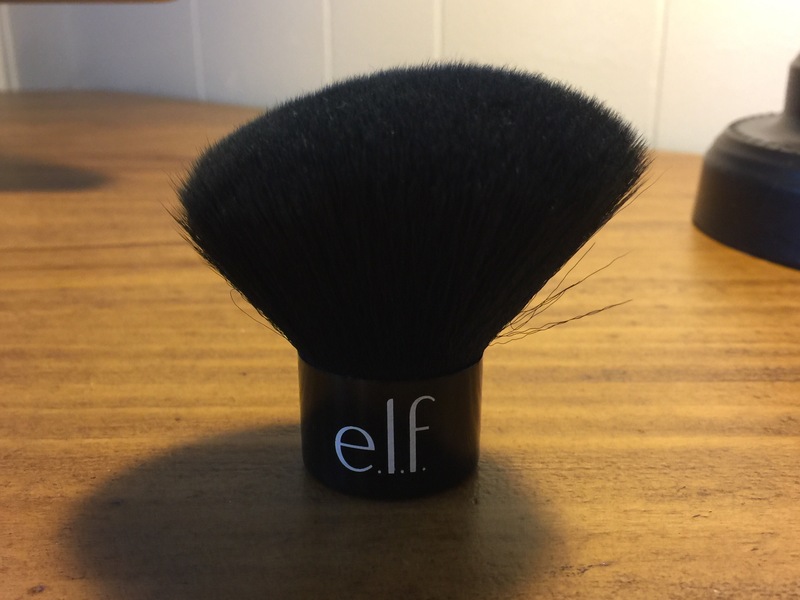 Elf Contour Kabuki Brush: I received this brush in a free mystery grab bag that came with an Elf purchase earlier in the summer. It is a little large for a precise contour, but in the summer I typically just use my bronzer to contour. Yes, I know a “true” contour shade is a cooler, gray-toned taupe that is meant to create shadows on the hollows of your cheeks. But my skin tone is already warm, and when I’m tan, that just looks ridiculous on me–I basically just look dirty no matter how well I apply my contour. So instead I like to contour with my bronzer, and instead of applying it to the hollows of my cheeks, I apply it just above where I’d normally apply contour. I sort of angle the brush upward from the hollow, if that makes sense. Then I take the bronzer around the perimeter of my forehead and jawline and down my neck. This brush is large enough that it makes easy work of blending out my bronzer. I love that it doesn’t have a long handle–it feels like I have a ton of control over the small base, sort of like holding a beauty blender. My only complaint is that it is a little difficult to dry after washing, since I don’t want the base to get wet but I also want to keep the shape. I do have one of those brush dryer things (you know, the stand with all the holes so brushes dry bristles down) and the base of this just barely fits in the largest hole, so it works, but it’s kind of a pain. But otherwise it is a fabulous brush. 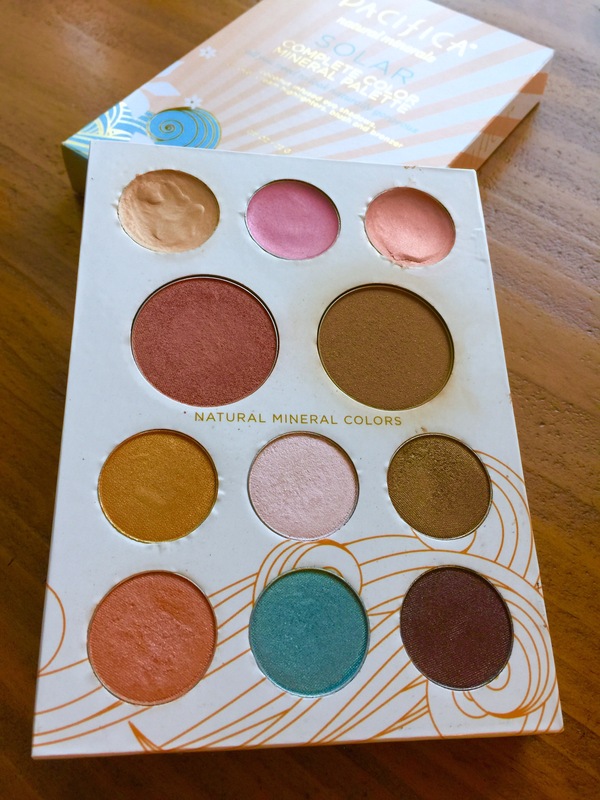 Blush and Highlighters in the Pacifica Solar Complete Color Mineral Palette: When I use a palette, I typically use the whole palette. If it’s a full face palette, that means the shadows, blush, and whatever else is in there. But recently I was reminded how much I love my Pacifica Solar Complete Color Mineral palette, and in particular the blush and highlighters. The blush is a deep brick red with gold shimmer, but on the cheeks it sheers out to look like a light glowy flush, but the brick shade makes it great for the transition into fall. There is no visible glitter on the face, and it lasts all day. The highlighters just take the look to the next level. There are three of them: a gold, a peachy-pink, and a deeper iridescent pink (I don’t use the last one as often). They are cream-to-powder highlighters, and are most easily applied by patting them on with your fingertips. Now, I used this palette a lot over the summer and was convinced the highlighters were drying out and giving me no color or shine payoff. Boy, was I wrong. Big lesson in testing makeup in natural light, folks. I tried them out again a few weeks back, and didn’t think much showed up, but as I caught glimpses of myself throughout the day, there was such a natural but very visible glow on my cheekbones. It looked incredible, and now I cannot stop wearing them, even if I don’t use any other items in the palette. A quick note: Because they are cream-to-powder, they do feel a bit drier on contact–you have to rub your finger around in the highlighter a bit to warm it up and make it more creamy. (It’s sort of like the formula of Wet n Wild Mega Last lipsticks–they’re dry but soften up as they warm with your skin.) My gold one has balled up a bit, as you can tell from the photo of this well-loved product, but it sheers out on my face. These don’t look like chunky or glittery or powdery highlights–your skin just looks luminous, plump, and hydrated. As the weather has been turning more dry, I can’t get enough of this product. So these are my favorites this month! I’d love to hear what products you’ve been enjoying this month–I am always looking for recommendations! Thanks! And congrats on reaching 100 followers! That’s awesome! I love the Pacifica Solar Palette! I have a post on it if you happen to stumble upon it and read it let me know what you think! Love this post, I have quickly become addicted to your blog! Thank you so much! I will definitely check out your post–I love your blog too!